Air Trespassing bill approved in California. Democratic Senator Hannah-Beth Jackson in California has written a bill that has passed the assembly, leaving only 50′ of airspace for UAV operators to fly in. 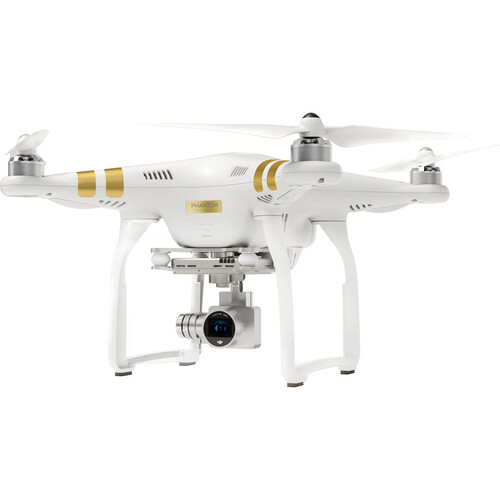 This new bill calls a UAV flying under 350′ trespassing, leaving only a 50′ window in which to fly UAVs in the state, legally. You can fly over businesses, though, it seems. It seems that law should apply to UAVs, too, instead of just making it trespass if you are under 350′. With this article, I question if their elected officials have seen any SCOTUS laws over the years dealing with this, and how their laws break the constitutional protections of the 1st amendment. All in all, this seems like a knee-jerk reaction to a non-issue. Mike Elgan from Computerworld has posted a very interesting article about the “drone” backlash. He goes into the problems we, as enthusiasts, are seeing, and some of the “reasons” no matter how unreasonable they are. Then, he goes on to refute the problems, and brings light to many of the falsehoods. I find it interesting, that the measured / non-inflammatory story has gotten 12 comments, while a much more inflammatory one would solicit FAR more comments. Of course, when a site lives on the number of clicks they get, those stories that generate the most eyeballs are the ones that get run. Is it any wonder why the inflammatory stories get posted infinitely more than articles like this? Everyone has heard of trolls on the internet… USA Today just allowed a troll into their newspaper. Under the guise of safety, this so-called expert uses examples that are downright false (as has been pointed out on this blog, the Fresno incident was not a consumer drone, but something 4 – 6′ wide. He talks about the upper limits of drones (the 55 pound variety) which again, are not consumer drones. The guy is trolling and attempting to destroy a hobby and business that thousands of people enjoy, and make a living on. So, now, we have to worry about people being published as “experts” that are nothing more than fear-mongers. We have idiots in all walks of life. Not just UAV operators. Why come down on all of the law-abiding, common sense following operators, instead of those that are breaking the laws? Those that break laws are not going to follow new ones. Yet, the so-called expert is asking to ban all UAVs. 99.99% of the sky is free from manned aircraft. A little common sense will keep you out of their way. Seems a wasted resource if only a privileged few can use it. As it is, RC planes and helicopters have flown for years, without problems. 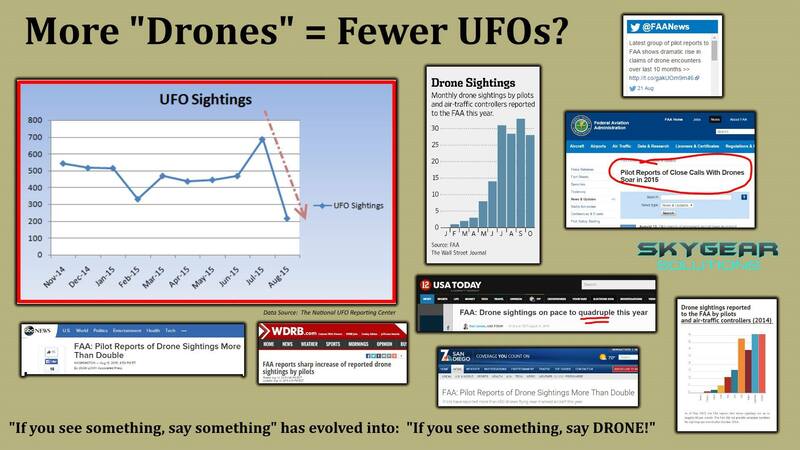 More Drone Sightings = Fewer UFO Sightings. Skygear Solutions posted this interesting graphic today, showing an interesting occurance. As pilots were encouraged to report UAVs, UFO sightings (Not alien sightings… stuff in the air that could not be identified) went down. There has been a ton of news lately saying how many drones have been near aircraft. When you read the actual data, you have to wonder about a large number of these drone sightings. The UFO data comes from the National UFO Reporting Center. 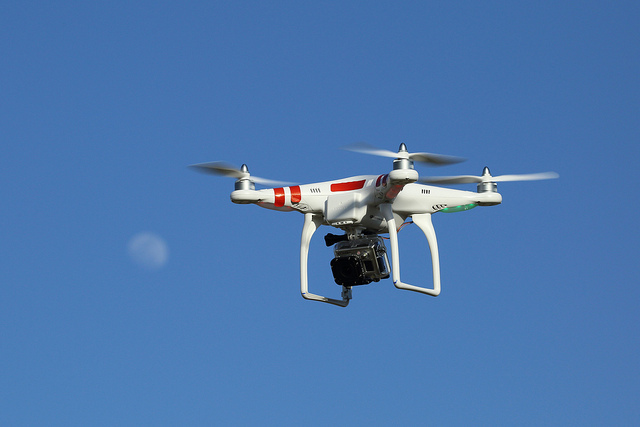 Another article about UAVs vs Telephoto Lenses. 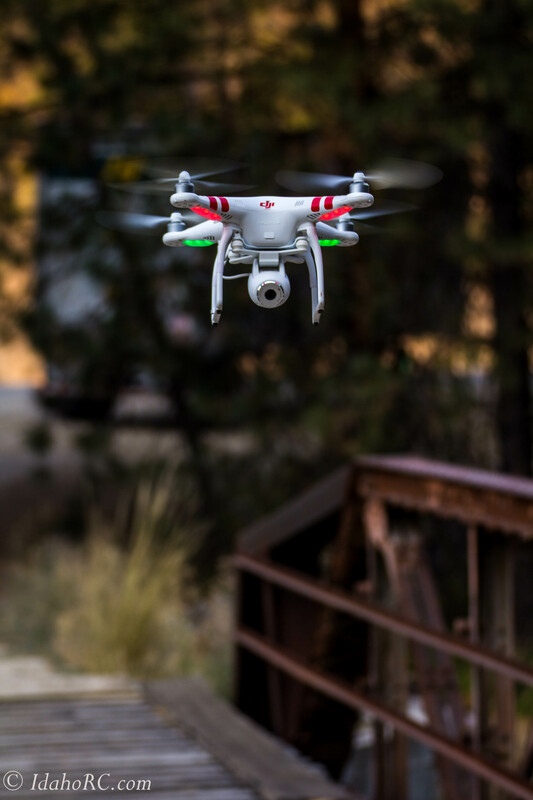 PetaPixel has posted a story by Adam Derewecki showing the capabilities of a UAV compared to those of a dSLR camera with a good lens and multiplier. In this story Adam gets shots of a friend from his building with both the UAV and his camera. Hands down the telephoto is the creepiest, in what it can do. Plus, a UAV can see/hear when it gets even close enough to take a decent photo. Learn to use the Flight Services Website to show your presence in the air. 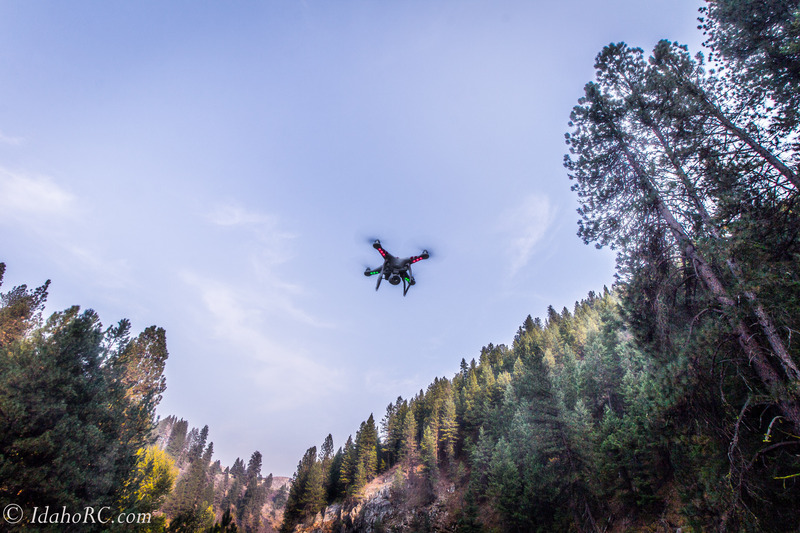 Popular Mecahnics features an interesting article from Chris Clarke about how to register your UAV flight. It explains how to use the Flight Services website to plan and publish your flight plan, to let other pilots know you are out there. This looks like a good resource to learn more tools to fully integrate UAVs into the sky with other manned aerial vehicles.